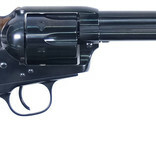 UBERTI CATTLEMAN BLACK 45LC - Corlane Sporting Goods Ltd. The legend of Jesse James as the Robin Hood of the Old West endures to this day, to the point that ballads have been written in his memory. As a fierce outlaw, he owned a whole panoply of revolvers, so picking one as "his gun" would be all but impossible. We have opted for his 1873 Colt, which we have complemented with a stern all-black finish and bison-horn grip, the ultimate Western antihero's revolver!